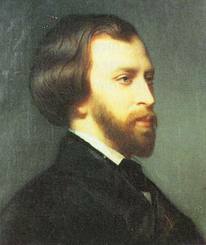 I spent an hour on three stanzas of an Alfred de Musset poem with my son. We read it together at least a dozen times and analysed it. Not for fun but for school. He may not have enjoyed it as of yet but I certainly did. You get a taste for poetry by reading it. The more you read it the more it grows on you. I can identify with my son's semi-reluctance to read a poet of many centuries past, sighing over a love lost. Can a twelve year old understand the meaning of nostalgia, doubt, remorse and melancholy? I believe these poems are the vehicles of these feelings, teaching us in its constant litany the effects, the causes and the impressions of these feelings. Poetry isn't just for the pleasure of reading, its notes and tunes remain within us as we look out to the beauty of this world, as we sense feelings we cannot name or identify, as we view our lives. We relate to our experiences through the rich vineyards of our past poetic readings. And when some of us write, poetic images resurface magically in the choice of our words or our images. Painters, sculptors and photographers, even architects and film-makers attempt to materialise the poetry embedded in their subconscious. The most talented songwriters are poets! Poetry is at the base of art. I pray my son, and his younger siblings, enjoy their study of poetry and look upon their world and their lives in a different light. Poetry was never my forte,though the Arab culture is festooned with poetry and prose.Appreciation at an early age is such a talent,that if acquired willl remain with you ever.